I have recently been reading Open City author Toby Talbot's book, The New Yorker Theater, with a foreword by Martin Scorsese. 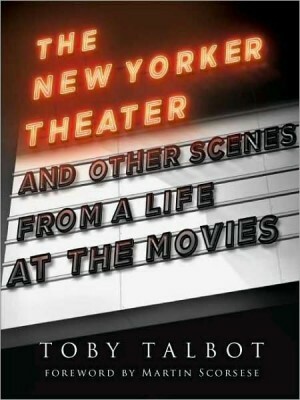 The book recounts the colorful history of Toby and her husband Dan's pioneering adventures in America's film culture, first as theater owners and later as film distributors. The New Yorker Theater, and later New Yorker Films, were responsible for bringing a broad array of international talent to New York, and then America--household names like Truffaut, Goddard, Bergman, Fellini, and Fassbinder--who, at the time the Talbots began showing them, were unknowns on whom no distributor or theater owner would take a chance. The immediate parallel to Open City is that we are taking chances on new generations of writers, some of whom may become the household names of the future, and all of whom have something interesting to offer in the present. This legacy of discovering and debuting new talent will soon be collected in an anthology forthcoming in 2011 on the occasion of the magazine's twentieth anniversary. But the connection to Open City that felt most immediate as I read Toby's book was the sense of abundance that fills its pages. There is always another discovery, a bracing new talent, and just as often all sorts of adversity and difficulty, which was somehow overcome as the Talbots built their theater business and later their distribution business. This wide-open sense of possibility has always been at the core of what makes producing Open City joyful and worth doing, and I would like to think the feeling permeates the pages of our magazine and books. Nearly twenty years ago, Esquire magazine included the then new title of Open City on its "Down-to-Earth Guide to Where Budding Writers Come From," one of their periodic attempts to organize the literary cosmos under the category, "Ivy: The Real Climbers. "If you extend this garden metaphor twenty years--eighteen to be exact--what would that shoot turn into? Perhaps a gorgeous skein of lush vines that cover a building. The building is the culture, or part of it, and it won't fall down if the vine goes away. But it would be missed. I write to thank you for your support over these years--as a subscriber, reader, or patron--and to encourage you to continue as we head into new chapters of Open City's growth. Above all I hope to impart the sense of abundance and possibility that I found in Toby Talbot's book. The Talbots first placed an ad for their theater, Lincoln Plaza Cinemas, in Open City #2, and it has run in every issue since. Abundance manifests itself in many ways. Please consider making a donation toward Open City's future by the end of the year. Details on how to do so can be found by clicking here.